Home » Blog » New Artists » The Wonderful, Quirky, Oh So Slightly Wobbly World Of Rayford! We are thrilled this month to be able to focus a spotlight on the artist Rayford! Rayford’s beautiful work draws its inspiration from the landscape and architecture that surrounds us, fusing with an eclectic- bordering on surreal, use of colour and composition to create a unique and captivating style all of his own. His fascinating work has an individuality that is widely appreciated by his fans, and his quirky “wobbly” pieces are fun and visually characterful, while still being easily identifiable. Born in Standish, Wigan, Rayford moved to York as a young child and currently resides in a village just outside Stillington to the north of York. 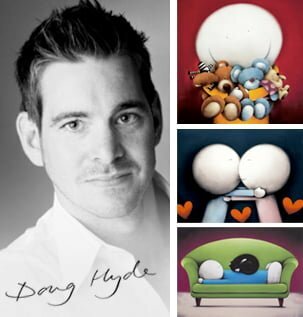 He studied Industrial Design at University, whilst indulging a burgeoning hobby for drawing. He eased some of the financial pressures of being a student by producing commissioned pencil drawings; one of which was sold to the Hon Simon Howard of Castle Howard, North Yorkshire! Whilst his work led him into the field of structural and industrial design for the first 10 years of his career, working as a 3D designer, Structural Exhibition Designer and Spatial Designer at various companies, he always found himself getting itchy feet after a couple of years. In the meantime, drawing continued to be a hobby that he attempted to fit into his spare time. This meant there was very little time to work on his development as a practicing artist and particularly to experiment with the riotous colour that we associate with his current compositions. Keen to explore the possibilities that further experimentation would lend to him, in 2010 he decided it was time to cast off the restrictions of working, leaving his current position as lead project designer for a Museum and Heritage Design Consultancy, and commit to his art as a full time profession. With the support of his then girlfriend (now wife) he allowed himself six months to begin to succeed, and immediately set about trying new things, experimenting with colour and moving as far as possible from the traditional rigid style of the pencil work he had previously produced. Fortunately for all, his gamble was a success and he has since been able to enjoy working on his stunning art full time. Rayford suggests that his process is both simple and straightforward, eschewing preparatory work, he prefers to commit straight to the canvas and allow the painting to evolve with a life of its own, creating bold stylised pieces filled with personality and impact. Not surprising Rayford cites the work of Salvador Dali as being among his favourites, referring to his interest in the “worlds he created and the colours and forms he used to do this”. He also cites MC Escher, after being given a book of his drawings by his grandfather and Escher’s influence can be seen in his earlier structured pencil work. His current and most recognisable work is generally created in acrylics, although he previously favoured oil pastels as a medium, and some of his pieces are still produced in chalk and pencil. Now signed up with Buckingham Fine Art Publishers, a huge endorsement of his work (occurring only a few years after starting out as an artist, no mean feat for someone self-taught), Rayford’s work is enjoyed by many and can be found hanging in galleries around the UK. His work is constantly fresh and evolving as he matures as an artist and finds new ways to express his creativity. He considers it important to work towards spending time trying some different things, and also trying to produce work in a different style. He allows himself, where necessary, a break from the “wobbly” pieces for which he has become better known, which helps him maintain an enthusiasm and passion for the work he creates. Certainly one to keep your eye on in the future, we are very excited to see which direction Rayford’s fantastic work will take next!